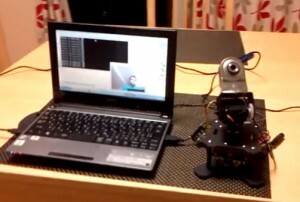 Christian Penaloza just posted a great demo video with one of our Desktop RoboTurrets running his custom face tracking code. He’s using OpenCV and C++ to do the facetracking, and C# for a user interface. This is a great example of the kind of thing you can do with the RoboTurret. We’re really excited to see the code for the project, as well as what else Christian has in store for the RoboTurret.